Add Exhaust System? 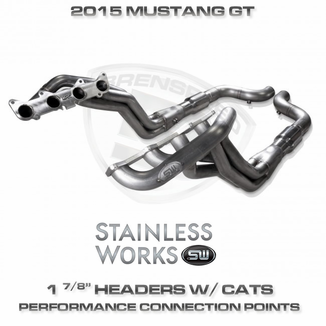 : No ThanksCat Back Exhaust with H-Pipe Crossover(+$1144.75)"Cat Back Exhaust with X-Pipe Crossover(+$1144.75)"
Stainless Works 2015-19 Mustang GT 5.0L 304 SS headers with CNC mandrel bent 1-7/8" dia. primaries and 3" slip fit collectors with 3" High Flow Catalytic Converters. 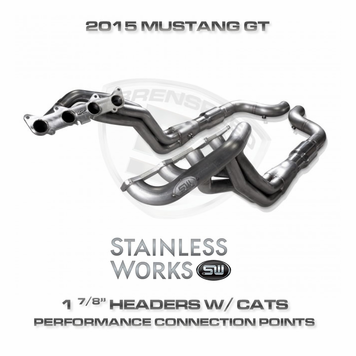 Made to fit Stainless Works performance connect catback, P/N M15CB3/ M15CB3X ONLY. The 3" outlet WILL NOT fit to factory cat back system. This system will provide a full 3" dia. system from header collectors to tips when matched with the Stainless Works Cat Back System for Headers.